an Italian investigation of a second American museum curator, in a case involving similar allegations of criminal conspiracy, seems likely to upend assumptions about any rapprochement. According to a 14-page legal notice from the public prosecutor’s office in Rome, J. Michael Padgett, 56, antiquities curator at the Princeton University Museum of Art, is a focus of a criminal investigation of “the illegal export and laundering” of Italian archaeological objects. The document identifies nearly two dozen works and groups of works — among them pieces of a calyx krater attributed to the Attic vase painter Euphronios and a group of Etruscan architectural terra-cottas — that it describes as having been looted from Italian sites and “sold, donated or lent” by Mr. Almagià to the Princeton museum through Mr. Padgett from the mid-1990s to the early 2000s. According to Princeton nine of these works are in the museum’s collection. The calyx-krater fragments, attributed to Euphronios by Padgett, appear to be the ones that were acquired in 1997: J. Michael Padgett, "Ajax and Achilles on a Calyx-Krater by Euphronios", Record of the Art Museum, Princeton University 60 (2001) 2-17 [JSTOR]. In addition, "The most recent Princeton acquisition identified by the prosecutor appears to be a sixth-century B.C. Attic vase sold to the museum in 2001". 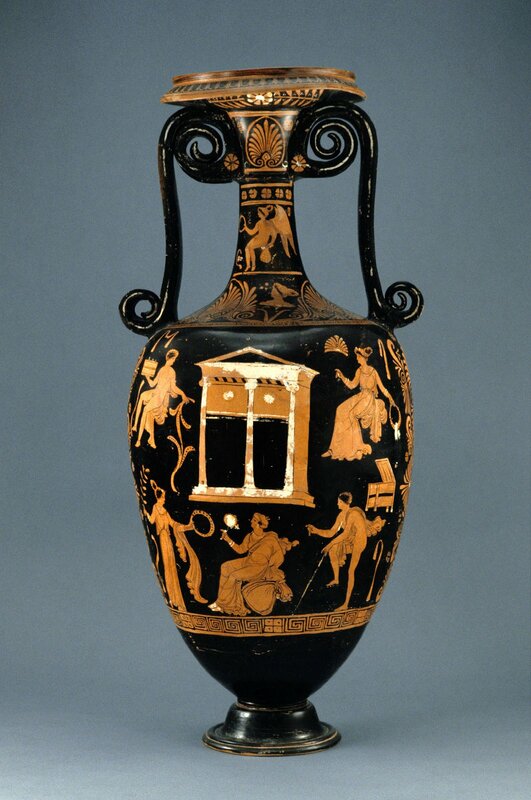 This may be the black-figured Tyrrhenian amphora attributed to the Guglielmi painter purchased in 2001 (inv. 2001-218) [JSTOR]. There appear to be 10 pieces associated with "Edoardo Almagià, 136 East 56th Street, New York, NY 10022" in Boston. They range from a Roman marble head acquired in 1991, to nine pieces of Italian impasto ware that were a "Gift of Jonathan Kagan and Sallie Fried in memory of Strabo CDX, 1995" ("February 15, 1995: purchased by Jonathan Kagan and Sallie Fried from Edoardo Almagià"). It is not clear what further revelations will be made or what the implications will be for the other museums. Red figure loutrophoros (ceramic), attributed to the Darius Painter. South Italian, Apulian, ca. 335-325 B.C. One of four objects to be transferred in title to the Italian government but to remain on loan to the Princeton University Art Museum.